This site is for our family and friends. Please feel free to send us your comments. Wondering about your retirement finances? Checkout my planning tool at RetirementForecaster.com. These are some large (40MB or more) picture files that were stiched together from many individual shots. The resulting panoramas can be zoomed in and dragged to view details that are very high resolution. View the panoramas here. We ended the lease on our Seattle apartment on July 31, 2006. On August 1st, we started a leisurely auto trip back home across Canada. Some pictures that we took are posted here. This a blog, so the pictures are in reverse chronological order. See our photo journal here. For our pictures of The Gates in Central Park in the winter of 2005, check out our blog. Since this a blog, the pictures are in reverse chronological order. 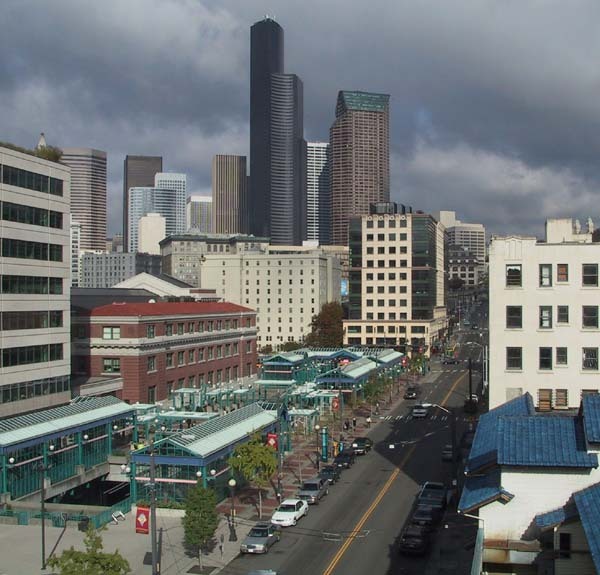 On October 10, 2004, we arrived in Seattle, and we signed a lease on an apartment in Seattle's "International District", more commonly known as Chinatown. On October 14, Betsy went to her first pottery class in her new studio. View some pictures here. It seems that a lot happens outside of our windows. We are on the corner of Weller St. and 5th Ave.(fancy address for New Yorkers!) and 5th is a main thoroughfare. As you can see from the earlier pictures on our web site, we have a nice view north up 5th Ave. from our apartment windows. Thanksgiving 2004 was an eventful weekend for activities on 5th Avenue. See what happened. I am taking panorama pictures of Seattle scenes and I will post them here as they are done. View the Seattle panoramas here. We had a fantastic experience as "pretend clients" at the Design Development (Residential) course at the Art Institute of Seattle. In the spring of 2005 we went to two sessions of the class: "A New Urban Dwelling In Downtown Seattle". The first was so the students could interview us in order to understand their pretend client's needs and desires for the new condo. The second visit was to hear the students give presentations of their designs for the two story, duplex condo. Here are panorama views of three rivers that we visited during our trip out to Seattle. View the pictures here. In September, I wanted to take a panorama picture of the New York City skyline before we left for Seattle so that I could hang something on the wall to remind me of New York. One clear morning, I went up to the roof of our apartment building and took the images that I used for this panorama. View the New York City panorama here. Look closely and you will see the Chrysler Building and the Empire State Building. On July 4th, 2004, it was a perfect day at the Jersey Shore. I went to the North End Pavilion of the Spring Lake beach to take a series of pictures that I stitched together to make a panoramic image. View the beach panorama here. We had a fabulous trip. In fact, we had two fabulous trips. Traveling the same paths as the Incas in Peru was quite different than swimming with the sea lions in the Galapagos. In Peru, the focus was on the Incas and the incredible structures they built in their 100 year reign between the Andes and the Pacific Ocean from Ecuador down to Chile. Our Inca tour visited Cuzco, which was the Inca capitol, and Inca ruins in the Sacred Valley. Our tour culminated with a stay at Machu Picchu. View the pictures of Peru. In the Galapagos, we were on a yacht for six days. A highlight of our onshore excursions was to see blue footed boobies doing their mating dance. But the real thrill was to be in the water to snorkel with the sea lions and the sea turtles. View the pictures of Galapagos. Betsy and her group of potters from Earthworks Pottery went on a second trip to Peters Valley, NJ for a wood firing. After the kiln had cooled for a week, they went back to unload the pots and Bruce went to take pictures. View the pictures of Unloading The Pots. For pictures of the complete wood firing process, look at these taken at the April 2001 Wood Firing Workshop..
New York - Why would you ever want to leave? Here is a day in the life of a New York retiree. View the Spring Day's walk pictures. Here are the four top pictures from Christmas of 2002. View the Christmas of 2002. For Thanksgiving 2002 we visited Betsy’s brother Patrick and his family in their new house in Chapel Hill, NC. Check out Patrick and Laura’s New House. In July 2002, we bought a condo in Fairway Mews. This is a townhouse that was built in 1977 on a golf course. We're not golfers, but we bought it because it is only seven blocks from the Spring Lake ocean beach and boardwalk where we go for swimming and walking. It's an easy bike ride, and we expect to be at the beach alot. At the condo we like to sit and watch the golfers play the 11th hole in front of our patio. Take A Look At Our Condo as it is, with the furniture that came with it, before we redecorate. P.S. We sold this condo in Sept of 2004. We had three wonderful summers at the Jersey Shore. But we decided to try something completely new -- so we went to Seattle! For Christmas, 2000, I received a Cannon Powershot G1 digital camera, Photoshop 6 imaging software, and an Epson Stylus Photo 1270 printer. Now my hobby is digital imaging. Here are some of the results. Wondering about your retirement finances? Why not plug in some numbers and see your year-by-year cash flow projections in graphs and tables. By using my free Forecaster program, you can project estimated yearly cash flows which include pension and investment income, income taxes and capital gains taxes, and the effects of changing the sequence in which you access your accounts to collect funds. You can even see a Monte Carlo simulation of your retirement plan. Download my planning tool from RetirementForecaster.com.